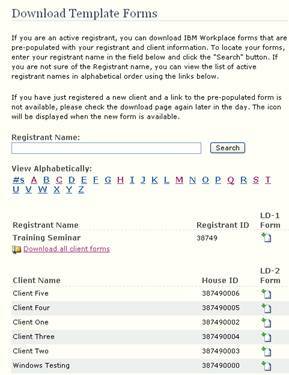 You can download blank forms to register for the first time, or pre-populated forms for each registered client, from the Lobbying Disclosure website. • Modify the form name, if needed, and click the Save button. Your form is now downloaded and available for use. Note: You can open a form for editing by double-clicking on the file name, or by clicking the Open button in the IBM Workplace Viewer toolbar. 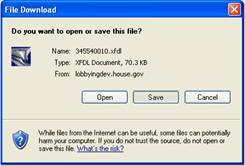 Do not try to open the forms using other applications such as MS Word or Corel WordPerfect. A window is displayed that allows you to navigate to the location where you want to store your forms. Pre-populated forms will be extracted and named using the House ID for each client. 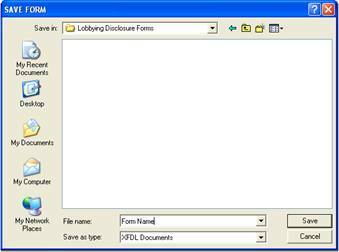 Your forms are now saved in your Lobbying Disclosure folder and ready to be used.